Where do rescue dogs come from? What about dogs that have bitten someone? Are Whippet rescue dogs retired racers from the dog tracks? What happens to rescue dogs when WRAP gets them? Why do rescues require spaying/neutering? Who decides whether an applicant is approved? Why should I adopt a rescue Whippet instead of finding one in a shelter? Why do you ask so many questions on the application? If this is a dog that was unwanted, why do I have to pay for it? So why do rescuers do it? Rescue takes in dogs whose first homes did not work out or who have fallen on hard times for various reasons. Rescuers take care of their medical needs, address behavioral issues, and assess temperaments to be sure these dogs can be healthy and happy pets. Most rescues are operated by volunteers who specialize in one or two breeds with which they have years of experience. Some take in all breeds or even mixed breeds. Each rescue operation is different. Some, like Whippet Rescue and Placement (WRAP), are large organizations with traditional or current ties to a national breed club. Others were started independently of the breed club. Some are local, statewide or regional in coverage rather than national. Many rescuers are simply individuals or families who work virtually alone to save as many dogs as possible in their own areas. Rescuers keep an eye on local animal shelters and try to “bail out” dogs of their breeds whenever they show up. Other dogs come directly to rescue from owners who are unable to keep them; some dogs are found abandoned. Sometimes a post on the internet leads rescuers to a dog in need. Many rescued dogs come from good homes where they were loved and cared for, but were given up for reasons unrelated to the dogs themselves: divorce, severe financial distress, a death in the family, a move. Some of them have come from homes where they were neglected or even mistreated. And yes, some are given up due to behavioral problems. A rescue dog ready for adoption has lived with an experienced dog fancier long enough to have had many of those issues addressed. No responsible rescuer adopts out a dog with serious behavioral or physical problems unless he/she tells the adopter in detail what the issues are and makes sure that the adopter is equipped to handle them. It’s true that many rescue dogs have some baggage. Some of them have had a tough start in life and not all come through it unscathed. But most people who adopt or work with rescue dogs believe that these animals know that they’ve gotten a second chance and try harder than the average dog to fit in. Rescues are often the best dogs, no kidding. WRAP does not adopt out biters. The Whippet is not a breed that bites under anything but the most extreme circumstances; one who has bitten a human usually has a severe temperament problem and should not be placed in another home. If the rescuer who took in the dog feels that the biting incident was truly an isolated incident due to extreme pain, fear, etc., the rescuer may choose to keep the dog as a personal pet, but it will not be adopted out by WRAP. No. Whippets are not often raced commercially, so fortunately, there are not large numbers of them coming from the tracks, as you see in greyhounds. Although some Whippets do indeed race, it is hobby racing organized by the owners. The racing Whippet goes home with his owner and usually sleeps on the sofa or curled up in the owner’s bed…just like any other well-loved pet Whippet. WRAP has a Board of Directors and Regional Advisors, as well as rescue volunteers in most of the 50 states. Many states have several volunteers. 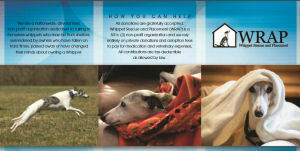 We find out about Whippets in need of help in a number of ways. A call or email may come in to a Regional Advisor or a WRAP volunteer. 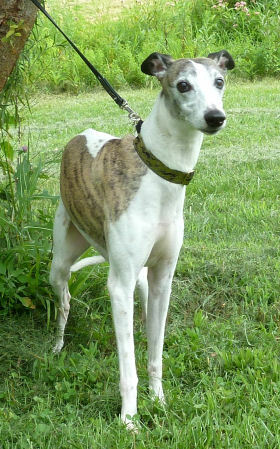 WRAP may be contacted by an owner who needs to surrender their Whippet to WRAP for foster care an placement. With organizational communication, WRAP may be contacted by regional shelters, animal control authorities, and our own volunteers when a purebred Whippet anywhere in the USA is in need of help. New rescue Whippets are evaluated for health, temperament, training, and other things that might affect their ability to be successful pets. They’re given necessary vet care and shots and bathed and groomed. They stay with the rescuer for anywhere from a few weeks to several months. Though most are ready for adoption a few weeks after coming into the rescue program, others remain several months. If the dog has been abused or neglected, he may be nervous and frightened. He must learn to trust people before he has any hope of finding a successful home. If the Whippet was given up because of a behavior problem, this must be evaluated and addressed through training or behavior modification before someone else adopts him. Money for rescue comes from adoption fees, donations, and rescuers’ own pockets. WRAP reimburses rescuers for veterinary and out-of-the-ordinary costs, but the individual rescuers pay the day-to-day expenses. The American Whippet Club provided the initial start-up money for WRAP, but rescue has been self-supporting for many years. Expenses can be overwhelming and dictate the limit on how many and what kinds of dogs can be accepted. Fortunately, WRAP is usually able to cover expenses for any Whippet it accepts. Donations are always welcome! Rescued dogs in particular should not be bred. No responsible breeder uses a dog of unknown ancestry. Rescuers see every day the misery that comes from irresponsible breeding…from placement in bad homes to genetic problems to temperament difficulties. The number of unwanted dogs euthanized every year is staggering. Rescued dogs should never be used to contribute to the very problem that often brings them to rescue. Besides, neutered dogs make better pets. Several types of behavior problems are less common in spayed and neutered Whippets, and the dogs are healthier for longer. Ask your veterinarian about his oldest healthy patients and you’ll find a majority are spayed/neutered. There are no significant disadvantages to neutering or spaying when weighed against the health benefits. 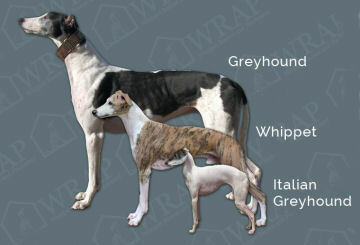 WRAP never releases an intact –unspayed or un-neutered– Whippet. The rescue volunteer makes that decision, sometimes in consultation with the Regional Advisor. One reason WRAP works as well as it does is that the individual rescuers are given as much responsibility and autonomy as possible. Adoptions are handled locally, not handled by a national committee who has never met the applicant or the dog. WRAP provides guidelines, but the volunteers are experienced rescuers who have their own criteria for adoptions. Fortunately, very few Whippets turn up in shelters, and when they do, it’s usually best for them to go through rescue before going into a home. Because they rarely stay long and aren’t watched closely, a shelter dog can have health problems that will have to be diagnosed and treated after you adopt. Behavior problems rarely show up in a week-long stay in a shelter. A rescue dog has usually lived in the home of a knowledgeable dog person for a few weeks or months before it’s adopted. Rescuers with several years of experience in the breed know the common problems — they may even know more about specific breed medical and behavioral problems than most vets, who cannot specialize in one breed. No one can predict your dog’s future or spot every problem, but rescue is miles ahead of most places you could get a dog. A rescue has been evaluated by people who know Whippets and who believe that your adoptee is a suitable pet. If she needs training, you’ll be told what she needs and the training most likely has been started. If there are ways this animal is different or if she has special needs, you’ll be told up front. Many people become interested in a breed for its appearance or because it is a current trend. They are often unpleasantly surprised when they discover that living with the breed is not at all what they expected! 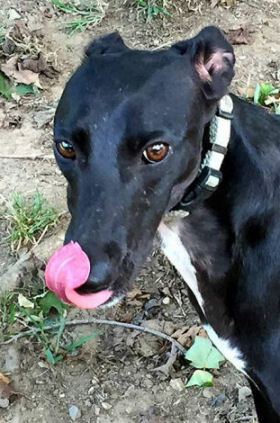 Rescuers can advise you on whether you really want a Whippet. Every breed is right for someone, but no breed is right for everyone. Most important, rescue makes a real effort to match an adoptee to your household. That means you’ll be asked lots of picky questions and possibly even be turned down for a particular dog — but it also means that when you do adopt, you start with a much better chance of success. Not every dog is suitable for every home. WRAP would not place a very shy Whippet in a noisy home with children or an energetic, boisterous dog with a frail person. The rescue Whippet has already had at least one unsuccessful experience; his next home should be his permanent one. Your rescue dog will be up to date on all recommended shots, not just the legal minimum. You’ll get a shot record and as complete a health record as possible, plus recommendations for future care. With a shelter dog, you usually get a brief guarantee period. A rescue volunteer will usually be there to help with any problems when they start … before things get so bad you have to give the dog up. You can call whenever you have a question or problem. And if it turns out that you can’t keep the dog, rescue will take him back at any time…whether it’s a week or five years from now. Next to having a child, getting a dog is one of the most demanding things most people do and there can be problems when people don’t realize how big a commitment it is. Because the commitment is lifelong, a dog should never be adopted on a whim … you may move on to other interests next year, but you still have a living, feeling animal who needs your love and attention as much as he did the day you brought him home. Many people who believe they know what a dog needs are remembering a childhood pet who was cared for by mom and dad, and during a time when things were simpler. All breeds have specific needs. For example, a Whippet must have a fenced area to run in at least three or four times a week and must never be off leash except in such an area. Whippets are not “yard dogs” and they need lots of human contact. Because of the high prey drive, they may kill other pets that run from them. The questions asked help both the rescuer and the adopter recognize possible problems in these and other areas before they develop. And sadly, there are a few people who want dogs for all the wrong reasons–for example, dog fighting or for “baiting” fighting dogs–and those people can be weeded out through a comprehensive interview process. Some rescuers require a home visit. You may feel a bit defensive, as if a social worker is checking on your children. Don’t be offended. These visits are just the last step in assuring that you and the rescuer have covered all the bases. Did you know there was a hole under the fence in the backyard? Have you thought about how your new dog might react to the aggressive fence-fighter next door? Are you sure you won’t mind a white dog on that new black sofa? Rescue dogs are already ‘second chance’ dogs; the questions are part of an attempt to get these deserving animals into the best possible and permanent homes. Don’t hesitate to ask the reason for a question or to add information. For instance, you may live in an apartment, but near a park where you could take the dog to exercise. Most rescue organizations say they require a fenced yard, but if your last dog died at age 16 and you gave all his walks on a leash every day of his life, speak up! In asking these questions, rescuers are not trying to be difficult; they very much want your home to be one of the success stories. Most are flexible, at least to some extent, and every case is different. Please be patient with the questions and understand that they are only asked to ensure the best for both you and the dog…to spare both of you the heartbreak of an adoption that doesn’t work. You might think giving a home to a dog no one else wants is enough. Many people expect rescue dogs to be free. However, WRAP pays for the Whippet to be spayed or neutered and will ensure that it is up-to-date on shots. Additionally, there are the ongoing supplies — shampoos, toys, treats, vitamins, plus the one-time costs of crates, mats, beds, grooming equipment, fencing, food and water bowls, etc. All of this comes out of the rescuer or rescue organization’s budget up front. Most of it will never be recovered, but if the adoption fees take care of the “big stuff,” the rescue can take in one more dog! You can imagine how things go. One Whippet arrives in good health, housetrained, and with no behavior problems, up to date on vet work (from a good owner who is, perhaps, moving overseas) and goes out to someone on a waiting list within three weeks. Maybe he was even dropped off and picked up at the rescuer’s house. Very little expense. But next comes an older dog, needing a spay, heartworm treatment, and other medical work. She must be picked up in a distant city and because she needs confidence building and since older dogs aren’t in great demand, she stays a year before being placed. Total donation for both dogs, $300 each; total costs well over $1000. WRAP appreciates extra donations if you can afford them! For the same reason you want to adopt: They love the dogs. Many Whippet rescuers are also breeders and are committed to maintaining the breed they’ve chosen. It is a way of giving something back to the dogs that have provided so much joy over the years. Still others enjoy working with lots of different dogs, many of whom have special training needs. And there is a unique sense of fulfillment in seeing a frightened, unhappy, and sometimes sick animal come into the program, gradually improve, and finally leave to become a healthy, happy, and beloved member of a very special family. All rescuers get a lot of satisfaction from helping good dogs and good people find happiness together. Can Whippets be trained to stay off the furniture? How much grooming do Whippets need? WRAP provides answers to these and many more questions! WRAP has no upper limit on Whippets it accepts for placement. Why adopt a senior Whippet? Learn more about how much the "Old Folks" have to share.